Simon & Schuster Books for Young Readers, 2016. Originally published in Great Britain in 2014. 28 pages. 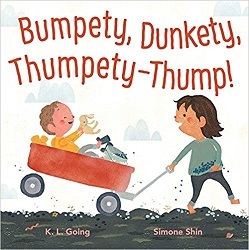 Here’s a sweet toddler-friendly story that provides counting practice along the way. 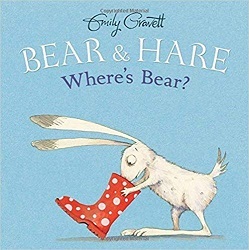 Bear and Hare are playing hide-and-seek. Maybe Hare should try hiding instead? Hare’s a lot harder to find. Sharp readers will spot his ears poking out. But when Bear looks under the blanket, the bed calls to him. Now Hare comes out and can’t find him! You couldn’t ask for a cozier story to make toddlers feel clever – and get counting practice in, too. Margaret K. McElderry Books, New York, 2016. First published in Great Britain in 2015. 32 pages. I’m going to use this book in Toddler Storytime this week. It’s got lilting, simple language with not a lot of text on each page. 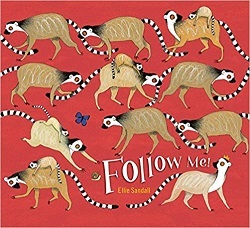 The pictures show lots of lemurs, exploring with their striped tails high in the air. follow me! . . . When their explorations bring them face-to-face with a crocodile, all the lemurs quickly follow the leader the other direction, back to the tree. This is a fun story with lots to look at. It ends with a cozy pile of sleeping lemurs. Dial Books for Young Readers, 2017. 32 pages. This extra large picture book with warm and friendly pictures would be perfect for a Toddler Storytime. There aren’t too many words on a page, and the situation is a little tiny bit scary – with a happy payoff. The beginning page shows Rabbit standing on his two hind legs and looking at his burrow with surprise. Rabbit goes to Cat for help, who promises to slink inside and pounce on the Giant Jumperee. Next Bear and then Elephant are likewise frightened away by a loud voice making scary threats. But Mama Frog is undaunted, even though all the animals warn her what the Giant Jumperee told them. 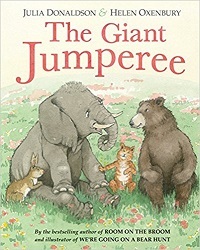 Savvy readers will not be surprised that the Giant Jumperee is not so giant when he comes out. The animals aren’t angry to be fooled. They’re all pictured laughing heartily. And Mama Frog tells the Giant Jumperee that now he’s coming home for tea. And it looks like Rabbit, Cat, Bear, and Elephant will join them. This is a happy book with just that little taste of a small critter trying for power. I wouldn’t be surprised if little ones would want to try acting this out themselves. Beach Lane Books (Simon & Schuster), 2017. 44 pages. Ah! Here’s a lovely new book just right for toddler story time. The words sing, and point out the sounds a child might hear as they go about their day. Pebbles in the pond fall dunkety-dunk. Toes in the grass go thumpety-thump. The above takes up a two-page spread for each line. Then the action continues: The children pick berries. When plopped into the bucket, they go plunkety-plunk. They take them home and make a pie with their parents, with more onomatopoeia happening. Then there’s washing up – both dishes and children. Nose taps nose with a bumpety-bump. Snuggle in the blankie in a lumpety-lump. Hearts beat close with a thumpety-thump. Like all good bedtime books, this one ends with children asleep in bed – but there is enough action and rollicking rhyme going on, that it can be read any time of the day. 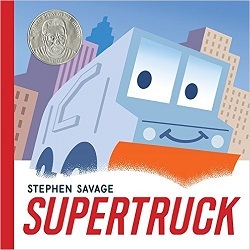 This sweet book begs to be read aloud. Disney Book Group, 2017. 28 pages. Yay! I have been invited to a baby shower, so I have a reason to purchase this book! I actually read it last year when visiting my newborn niece, but I didn’t have a chance to write a review. Now I’ve been enjoying the book before I wrap it up…. What I need to do is simply urge you to read this book. It’s brilliant. You will enjoy it. I’ll say a little bit about it. 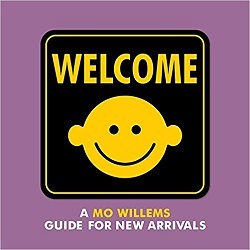 It’s written as a sort of travel guide for a new baby, telling them what to expect. The illustrations are essentially icons, as found in manuals. It’s funny and charming. and will be updated on a regular basis. your being right here with me . . .
while we read this book together. as comfortable as possible. However . . . There will be UNEXPECTED EVENTS. There will be HUMAN ERROR. A warm and delightful book that tells newcomer what they can expect out of life, and that they have people standing by 24 hours a day, 7 days a week, to provide Love. May this book get many chances to be read child and parent together. Source: This review is based on a book I purchased via Amazon.com to give away. Orchard Books, New York, 2015. 36 pages. Okay, this book is wonderful. For teaching about the alphabet, about counting (to eight! ), about identifying multiple animals. Find the one animal on each page that is pictured 8 times – 8 ants, 8 badgers, 8 chickens. Find all the other animals, too. Some may be familiar, such as a cat, and some not, such as a muskrat. (For help, see the “Did you know” section in the back.) But every animal is amazing and beautiful in its own way. Especially the hippopotamus. Let the exploring begin! *Why the number 8? Because 8 is great. Because 8 is round and adorable. Because 8 is fun to count to (move over, 10). Because 8 is not too big, and not so small, but just right. Because 8 is my favorite number. This is indeed a book for exploring. 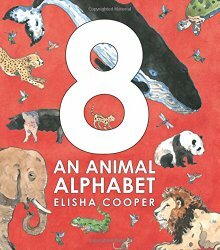 You can pretty quickly see on each page which animal is pictured 8 times, but it’s not a rubber stamp. The animal is pictured in 8 different poses, or perhaps even 8 different varieties of the animal. I grant you, the 8 ants aren’t terribly varied, but the 8 chickens include roosters as well as hens, the 8 goats include some kids, and the 8 moths and 8 newts come in many different colors. The format of the book is the large and small letter in a corner of the page and the names of the animals at the bottom. The animals are all mixed up on the page, not necessarily to scale. These are paintings, not photos, but they’re lovely paintings, and you definitely get the idea. But the key in the back of the book will be needed. So this is a good book for kids who like “Where’s Waldo” or any book of detailed pictures. I suspect it will take a few times through the book before parents know which animal matches every single name. And of course, one of the animals on each page shows up 8 times. So of course you will count them! Armadillos spend almost eighteen hours a day napping. Deer can see blue, yellow, and green, but not orange or red. Dung beetles are able to tell which direction they are going from the position of the sun and the stars. Gibbon couples start each day by hooting at each other. A single oyster filters over forty gallons of water a day, cleaning water for other animal life. The skin of the rhinoceros is more than an inch thick. Vultures poop and pee on their legs to keep themselves cool. Xeruses hold their tails over their heads to shade themselves from the sun. A yabby’s shell will match the color of the water it grew up in. Yapoks have both webbed feet and stomach pouches. Savvy parents probably won’t get started reading all 184 animal facts the first few times through the book. Pointing and naming and counting will keep you plenty busy. This looks like a perfect book for my toddler-soon-to-be-preschooler nieces, or for anyone interested in exploring, naming, learning, and counting. Reading this book makes me want to immediately do a toddler storytime. It’s got so many elements to make toddlers giggle: Kisses, dinosaurs, and stomping, chomping, and whomping. She doesn’t get it right. Cue lots of toddler giggles. “This time, if I’m really, really careful and I only use my lips . . .
Disney Hyperion Books, New York, 2012. First published in Great Britain in 2011. 28 pages. Simplicity. This book has it, in a beautiful form. I recently had the joy of being promoted to Youth Services Manager at my library branch, so I get to do children’s programs again! Tomorrow, I’m doing a Mother Goose Time for babies from birth to eighteen months. In Mother Goose Time, we mainly do rhymes and songs in the parent’s lap. But I like to work in three books that are short and simple and that the parents can read along with me. One Two That’s My Shoe! is perfect. The text is reminiscent of the old rhyme “One Two Buckle My Shoe,” going from one to ten with a rhyme after every second number. However, this book puts a story to the rhymes. With One Two, a dog has taken a little girl’s shoe, and is running away with it. This book is simple. The illustrations are done with printmaking, and look old-fashioned and classic. With at most three words on a page, you can read it quickly for the little one with a short attention span, but there’s plenty to talk about. Will the dog get away with the shoe? What will stop him? As a counting book, it’s also excellent. All the objects passed are easily counted, with none tricky to find, but covering a wide scope of objects, and variety within the objects. The objects are not identical, but it’s easy to see that they belong together. Each number is both written out in the text and represented by a numeral in a corner. Next to the numeral, there are silhouettes of the object counted in the picture, so it’s nice and clear. This is simply a lovely first counting book, and one that parents and children won’t get tired of any time soon. I’m happy to show it off at Mother Goose Time tomorrow. Tricycle Press, Berkeley, 2011. 42 pages. Quite simply, this book is wonderful. It’s an alphabet book where all the letters are made of rocks. What’s more, all the objects that the letters start for are also made of rocks. She’s got some normal words for alphabet books with surprising rock shapes: e is for elephant. (Yes, the rock is shaped exactly like an elephant head!) i is for igloo. (Yes, an igloo-shaped rock, complete with a door.) L is for Lemon. r is for rabbit. You get the idea. Then there are also some surprising words, with perfect rock illustrations: c is for couch potato. (A potato-shaped rock is resting on a couch.) J is for Joy. (Two happy faces smiling at one another.) O is for Ouch! (This rock looks like it’s been punched in the nose.) T is for Toast. (I would not realize that rock was not a piece of bread if it weren’t in this book.) And the book does pass the X test: X is for XOXO. The rock looks exactly like two people locked in an embrace. This is a book born from the sea. Some people walk the beach searching for shells, all the while passing by the little rocks that make up this book. This collection began more than ten years ago, as I discovered rocks on the Florida seashore that looked like letters. It became a real passion of mine to complete the entire alphabet. For many years, I waited for the letter K to appear. There was nothing I could do to make it show up. I understood that nature has its own timing, and my job was to be aware and expectant. The natural world is rich with inspiration. Finding these letters, and rocks that looked like objects to match them, was a process of believing that anything is possible. These are beautiful sculptures, little works of art. I feel honored to share these rocks with the world. These compositions are intended to allow these rocks to speak for themselves . . . and for us to imagine what we would hear if rocks could sing. This book will inspire the reader to start a collection of their own. Or at the very least to look at nature with fresh eyes. This is now among my favorite alphabet books. You are currently browsing the archives for the Good for the Very Young category.